Physitrack's patent-pending program designer (shown below) lets you quickly customize your client's exercise program. To remove an exercise from the program, click the red X. To change the amount of sets, reps and other parameters for an exercise, click the exercise. A modal slides up below the chosen exercises. Click on "Done" for all changes to be captured for all exercises at the same time. Different exercises on different days? Daily programs, where the same exercise is repeated day in day out, 7 days a week. Weekly programs, where you can specify different exercises for different days, including days without any exercises. A week lasts 7 days and starts on the day that the program started, for example Thursday. 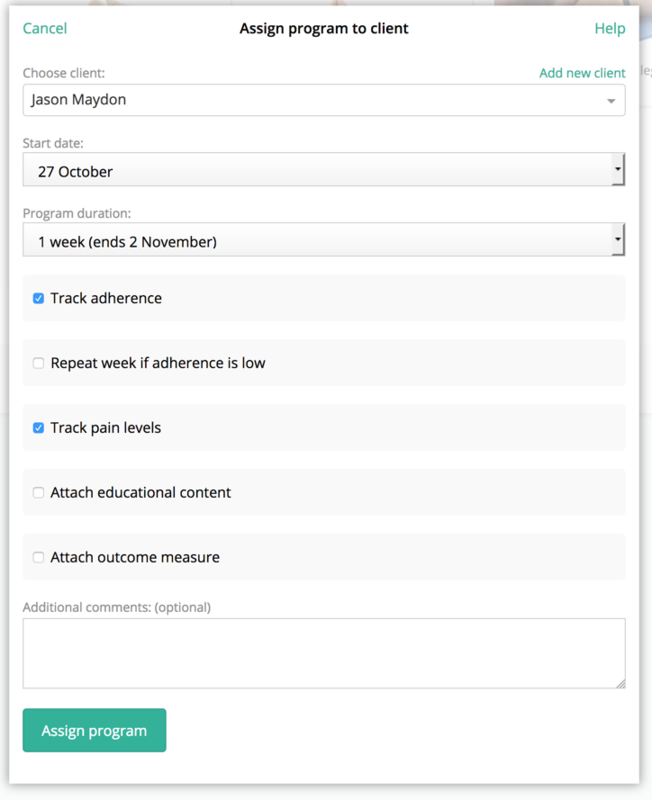 To switch between a daily and a weekly program, simply click the "Change to weekly program" (or "Change to daily program") link at the bottom of the program designer. Note: once a weekly program has been assigned to a client, it can no longer be changed back to a daily program.